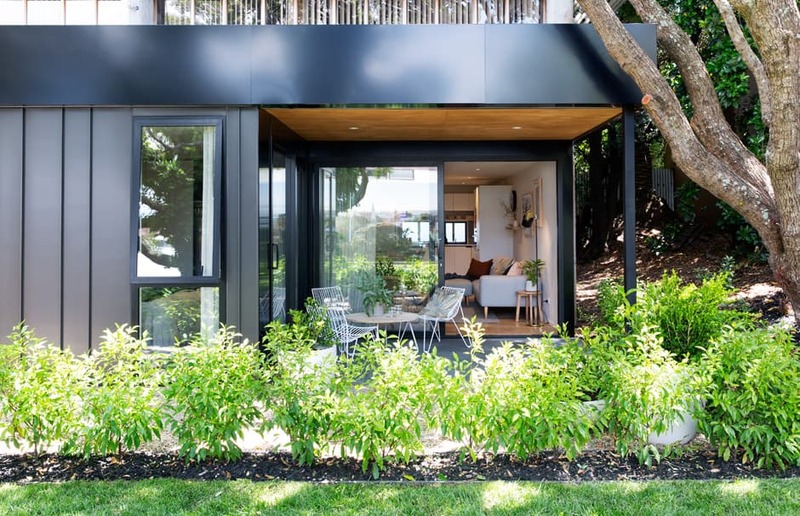 Inspired architecture and shared green spaces make this new pocket neighbourhood in one of Auckland’s oldest ’burbs a place to live and play. In association with FABRIC of Onehunga. The suburb of Onehunga at the heart of Auckland’s isthmus can lay claim to being one of the city’s oldest. But with time comes growth, and in the early ’60s, commercial warehousing crept into the residential area in response to Auckland’s need for industrial development. Fifty-odd years on, however, the bones of the neighbourhood remain, along with tree-lined streets, character houses and a bustling village, not to mention transport connections to downtown, a short 10km away. All valuable assets in a city in which the need for housing is at an all-time high, putting Onehunga in a prime position to be returned to its residential roots. This time, though, the approach is thoroughly modern. 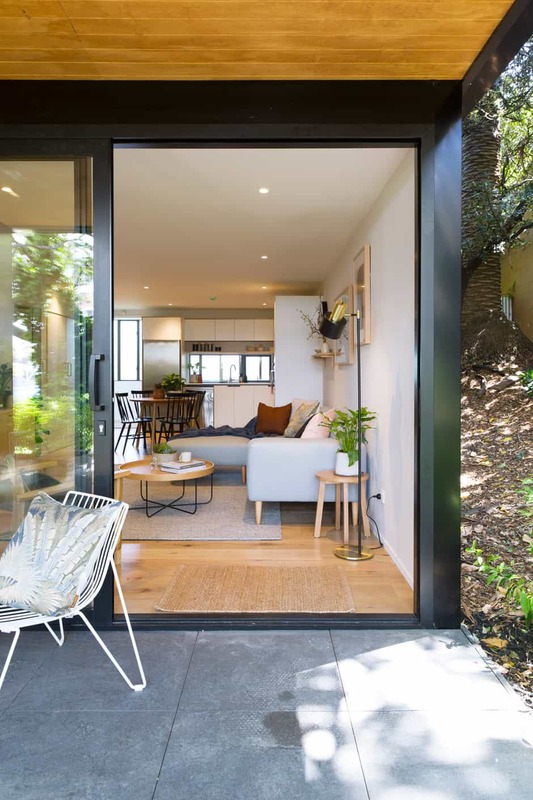 Enter FABRIC of Onehunga, a development by Lamont & Co with a vision of higher-density living modelled on urban design ideals seen in international cities, all while retaining the community spirit the area is known for. EXTERIOR The materials used at FABRIC help to create a sense of place. Standing-seam metal cladding, textured concrete and steel mesh are representative of the neighbouring light industrial buildings, while warmth and residential scale is provided through timber accents within the interior spaces and landscaping. TOP Wooden balcony soffits lead the eye into textured timber overlay flooring throughout the living and kitchen area. 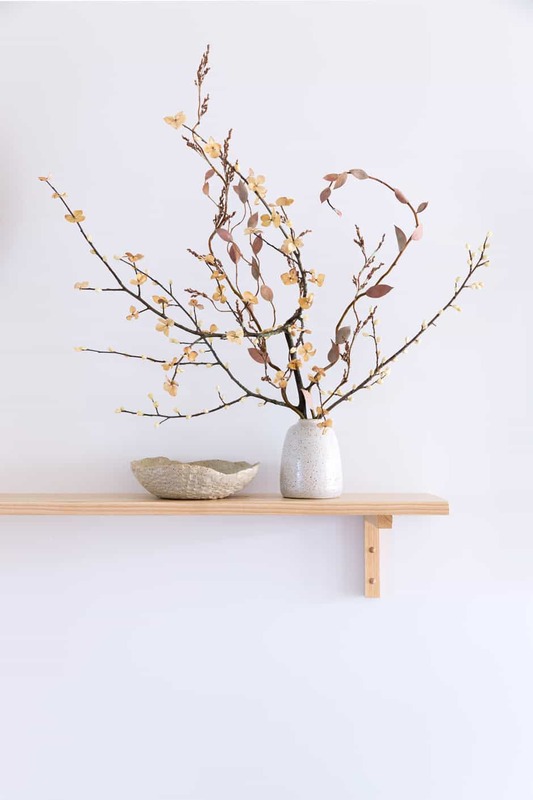 MIDDLE In the living room, handmade ceramics by Holly Houston and a dried arrangement by Mark Antonia rub shoulders on a shelf by Douglas and Bec. KITCHEN The plywood kitchen cabinetry has been finished with laminate. The exposed ply end grain reveals the honest nature of the material and provides interesting contrasting detail. “The attractions of this project were that we had a large land area to work with to create a welcoming neighbourhood environment – and being next to established housing with easy access to infrastructure meant all the ingredients were present to create a really good community,” adds Tim Lamont. LIVING Photographic artwork South (left) by Brooke Holm and No 14 by Berit Mogensen Lopez hang above a sofa and coffee table from Città. The floor lamp is from Lighting Direct, and the Sherpa Weave rug by Armadillo & Co is from The Ivy House. Combining the best elements of urban design within a suburban context, a collection of low-rise buildings creates a ‘pocket neighbourhood’ on the site. 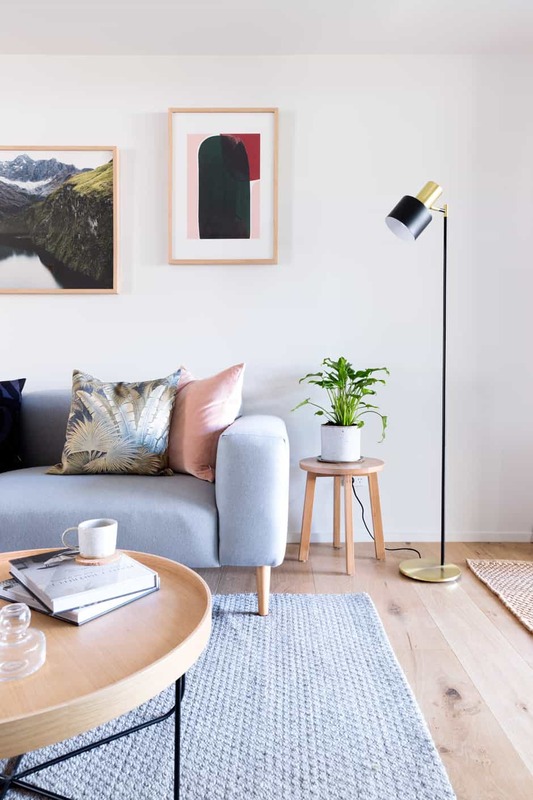 Organised around a series of green spaces, five buildings with shared atriums and elevated walkways house roomy apartments overlooking plant life. LIVING The key priorities of the design have ensured that all of the living areas and bedrooms open onto greenery and are orientated to maximise natural light and ventilation. Large sliding doors enhance the spacious feel and allow access to the park from ground-floor dwellings and leafy views from upper-level balconies. 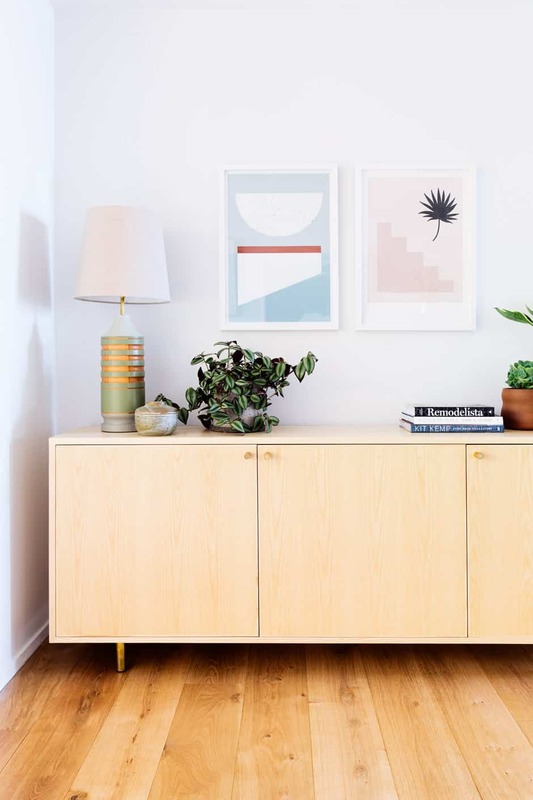 ABOVE The muted tones of Shapes Study No 2 and Palm Stairs by Samantha Totty pair prettily with a DS Hand Turned lamp and sideboard by Douglas and Bec. A collection of plants (in pots by local ceramicists Renée Boyd and Felicity Donaldson of Wundaire) throughout the display suite continue the green theme planned for FABRIC. The central common park will become a social hub for the development, providing a barbecue and seating area that encourages residents to meet and gather, as well as space to kick a ball or sit in the sun on the large lawn. Inside, one-, two- and three-bedroom apartments offer opportunities for all kinds of lifestyles; be it single occupants, young families or downsizing couples, these dwellings are all about diversity. 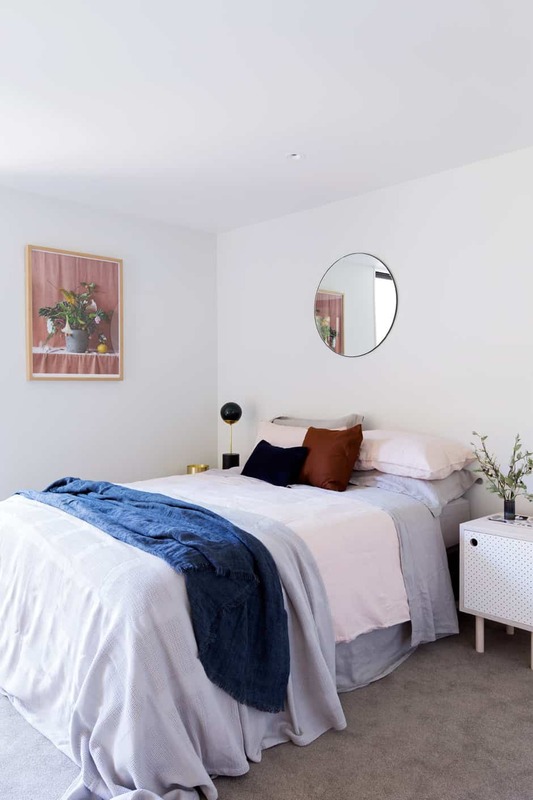 FAR LEFT In the guest bedroom, Botanical Garden by Billie Culy is reflected in a Circular mirror by Mark Antonia. On the bedside table by Homebase Collections is a Line table lamp by Douglas and Bec. LEFT The bathroom vanities echo the kitchen cabinetry. 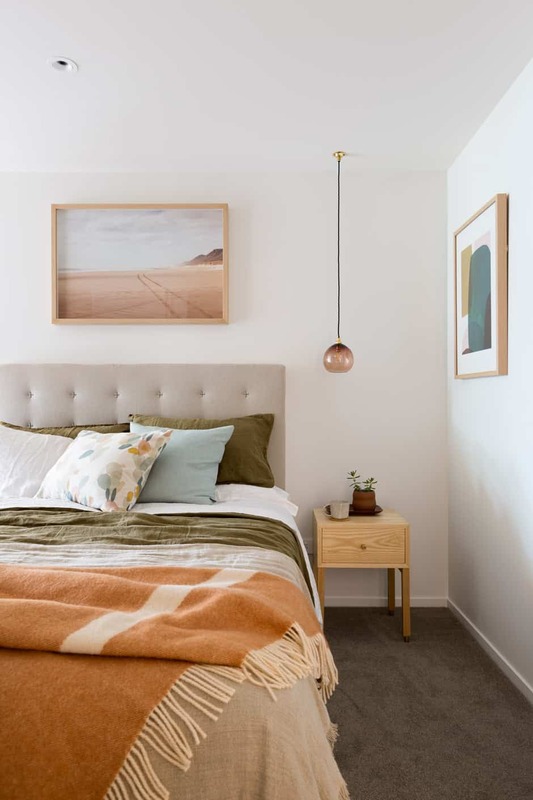 BELOW Glinks Gully by Duncan Innes features in the master bedroom, where a Monmouth Glass Studio pendant is suspended over a Douglas and Bec bedside table. OPPOSITE The guest room connects to the courtyard and would work equally well as a second living area or study. Two contemporary monochrome colour schemes were devised for the apartments. 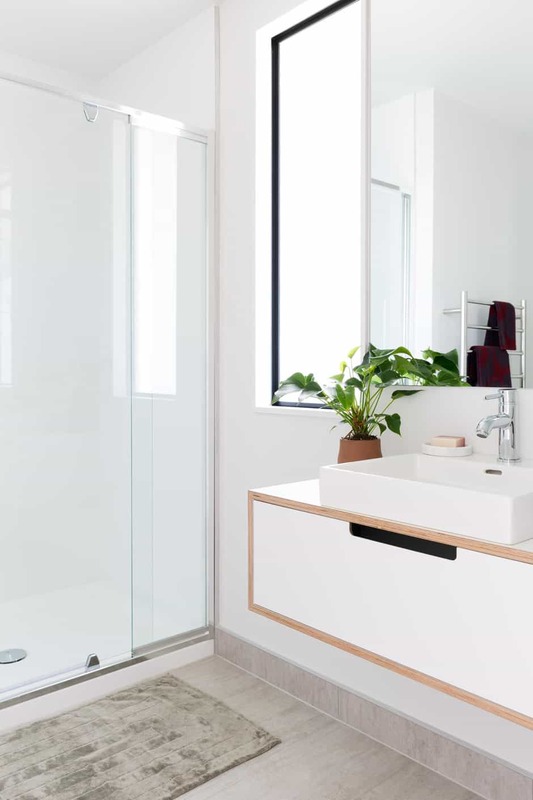 Owners have a choice of jet black or pure white kitchen and bathroom cabinetry, complemented by materials in supporting neutral tones or a darker industrial palette. ABOVE The guest room connects to the courtyard and would work equally well asa second living area or study. Clever design was used to offer a variety of floorplans to suit a range of budgets, without compromising the quality of the living environments. 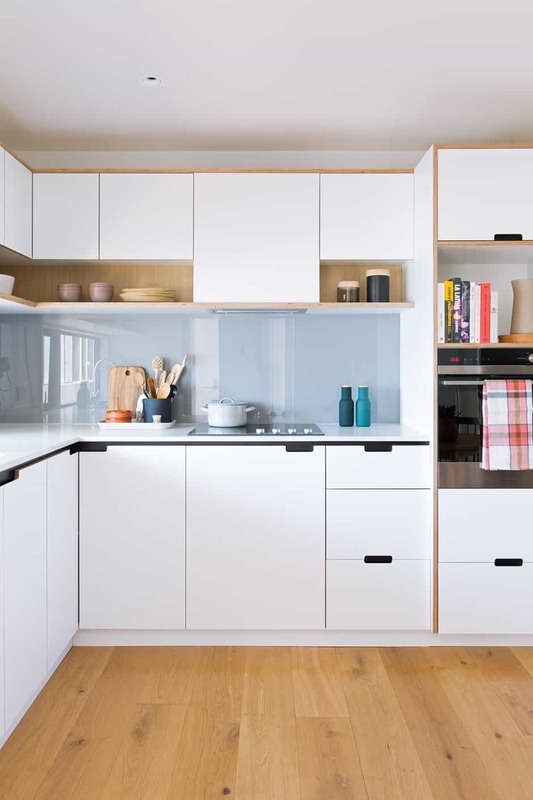 For example, in the smaller apartments, an open-plan, L-shaped kitchen layout flows seamlessly into and overlaps with the dining area, rather than having an island bench that would cut off the kitchen and restrict the size of the dining area. 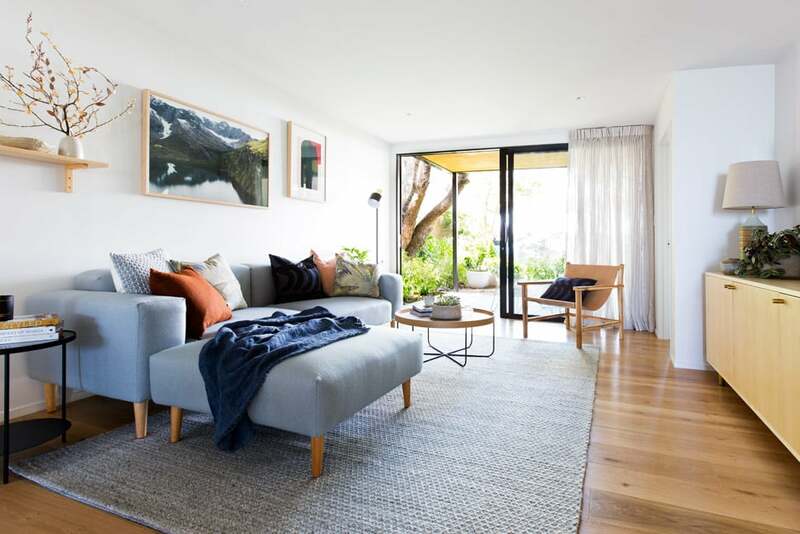 Everything about FABRIC of Onehunga is well proportioned, and the concept of apartment living with a bit of a backyard is an appealing proposition as we move towards a future that sees more people living closer together in our biggest city. “It’s been a real collaboration of ideas with the teams involved,” says Tim. “We like to ask ourselves, would we buy something here or like to live in a community like this? It’s usually a fairly accurate test. And the answer to that is: yes.” fabricofonehunga.co.nz. Visit this display suite at 11 Spring Street, Onehunga.